In the last one month, I spent quite a lot of time identifying the best streaming device for my home television. To start with, those who know me will understand my first principal of choosing a device would be economical / Frugal. I tried out both Chromecast and Roku HDMI Stick past few days for my use case and landed with Roku HDMI Stick. Roku Stick is truly a winner even if I compare this with Apple TV & Amazon Fire TV . Let me look at the comparisons among the four and why I ended up with Roku Stick. I am not going to do a table comparing features of Roku to other three products, because CNN already did an article on this. Please check this article by CNN called Amazon Fire TV vs. Chromecast vs. Roku vs. Apple TV. So I do not want to repeat the same info and duplicate something on the net for you . I will provide some of my learning from reading these and using the devices. To start with since I was looking for one of the cheapest device, I only picked up the low end models provided by Roku, Google , Apple or Amazon. Amazon , Roku has a higher end models but these lower end models pretty much does the job for us, unless you are some one boasting a 60-70 inch TV and looking for ultra fast streaming device etc. If you are looking for an ultra fast best device and do not mind spending that 100 dollars for your super costly television set - then Roku 3 is the best and clear winner. Roku 3 even has a killer feature , where you have a head phone jack on the remote and watch the TV with audio on headphones. None of the other devices provides this option. Also Roku is in the phase of releasing voice commands by adding microphone to your Roku remote. This would make Roku 3 even better. If you are someone like me, with a cheap television set in the range of 32-50 inches television , Roku HDMI Stick does the best job at just half the price. Some of the use cases that were important for me in watching television. 1. Does the Streaming stick provide a setup box like experience without being dependent on one more device other than the TV & streaming device? It is a clear yes for Roku.But Chromecast or Apple TV are just your companion device to stream content from other Android or iOS device like your Tablet or phone. I had to ensure I keep charging my tablet or iPad use that to stream movies from them. It is such a jarring experience for watching TV honestly. I do not want to always handle one more device to manage content. Roku Stick does that job clearly, it is like a set top box, with apps managed using their dedicated remote only to navigate. They also give a remote control app for your Apple or iOS device, incase you are someone finicky of having one more remote control in home. But once you play the content, you don’t need to be dependent on the device or remote to be on while it is playing. Which is a big freedom. I struggled with Chomecast, because I had to ensure my tablet is charged and I had to keep pushing content from tablet every time I liked something. Was not a seamless experience. 2. Can I watch Indian Television Channels – Like Tamil / Telugu / Hindi / Malayalam Language popular Television shows from the device? For Roku we have a dedicated app called Dishworld and this is the best app for Indian Channels so far I have seen. Oh! Dishworld is officially now called as Sling International , they ditched the Dish name and moved to the mother brand of Sling. You should read My money blog to understand why Sling TV is another clear winner if you are a sports fan with just 20-25 USD a month you could save on your cable network bills. So Dishworld/ Sling International provides a base language pack as minimum as 25 USD and you can top it up with additional channels if necessary. You can watch live those channels or recorded version for the past few days as much you can scroll through that remote. But very clear and easy to watch through Roku without any hassle of one more device. You can take up their device offers and get a Roku Stick for free if you sign up for 3 month in advance, along with a 1 month free bonus subscription. So all in all with 90USD you would have 4 month subscription + a free Roku Stick which is a pretty great deal to land with. For Chromecast, users you can still use Dish TV but you need to hang on to the Tablet and play the channels from your android tablet and see those apps crashing atleast more than once a day. I even tried the Yupp TV for Indian Regional channels, which is not part of Roku in US, so you have to use Chromecast screening. Pretty jarring experience, not a great way to watch television for me. Was not a happy customer. So your Roku stick / Roku 3 does the job if you are a desi like me living in USA and finding solutions to watch Indian channels. 3. Can I stream movies from my laptop ? Or Can I stream web videos from my laptop to Roku ? This is a very important use case for me. Since I am not a fan of watching TV shows unlike my wife. I am a big fan of watching movies, and all I would want is to watch some movie either streamed from my laptop and that need not be a YouTube or a NetFlix content. I know NetFlix, Hulu, YouTube all has dedicated apps for streaming through any of the four mentioned devices. But , I am desi guy watching most of the Tamil / Malayalam / Telugu movies and some Hindi movies as well. Netflix , Hulu or even YouTube does a good job for me. Sites like TentKotta.com, Einthusan.com does the job for me. TentKotta is a premium 8 dollar a month Tamil movie streaming site. It is legal to use , and you pay a monthly subscription. So can I stream movies from my browser to the TV using a Roku or Chromecast or Apple TV. I know chromecast was a clear winner in this because you can cast pretty much anything you see in your Chrome browser to the TV using the Chromecast. So just for this use case is it the only winner. For apple TV if you have an Apple device you can do Airdrop not from your Windows laptop like me. Given its closed solution to iOS and Mac, I am not getting into Apple solution only. I wanted a clear inter operable solution. Roku has a beta solution and that is when I felt Roku Stick is more than enough and returned my Chromecast device. Roku Screen Mirroring is your solution for that. This is pretty well explained in this Roku Forum page. *Below text in blue is from Roku Forum Topic , I just copied here to get continuity as you read through this review. Those in black or my additions. What is screen mirroring? The screen mirroring feature allows you to mirror your compatible mobile device's screen onto a larger TV screen wirelessly. This feature is currently made available as a beta feature on select Roku players and devices in the US and UK. Verify screen mirroring is enabled on your Roku player. Just go to Settings in your Roku, and check for Screen Mirring Option. Ensure it is enabled. Then select your device (phone, tablet, PC) platform. Your device must support screen mirroring . Windows / Windows phone Rocks here, ( Android also allows this), you just need to project your screen to this Roku device. Ensure both your laptop and Roku are connected to the same WiFi. How you project your screen in windows just in a similar way you can project. Before that go to devices and add Roku to that display device. Once you have projected your screen to Roku – either by duplicating your screen or extending your screen you can play any content from your latop or streaming content from your browser. Can I stream web videos from my laptop using Roku? Can I screen cast videos from my browser to Roku? Can I or mirror my screen from my laptop to Roku? For all the above questions use the Roku screen mirroring option that comes with Roku Stick or Roku 3 only at this point. So just this canceled the biggest plus I had with Chromecast. 4. Can I play streamed music using these devices? Yes, using Pairing of YouTube Account and Send to TV option. Another important use case for me. I use TV like a music player to play some interesting music from streaming service like YouTube or Spotify etc. Chromecast is a companion device for YouTube. But Roku also has a YouTube app which came out recently which needs a lot of overhaul. If I wanted to play youtube mostly I used the screencast option for android and played it from my tablet. Searching from YouTube using the remote typing every letter is painful. This may look like a minus for Roku but you can use your Roku similar to the way you would have screened videos from youtube using a Chromecast. All you have to do is Pair your YouTube account with Roku. Under “Settings” find the “Pair Device” option. Enter the pairing code shown on the TV into the box below. 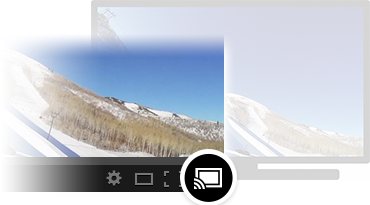 Click the icon to select the display on which your video will play. Spotify in Roku works well with playlist and your account if you have a premium account. Last about Discovery Roku search is able to search content, apps and everything across one single search box and I don't need to search for a movie in every apps. This is such a big time saver. A cross app search is another killer to discover content / apps. So with the above 4 major use cases, for any Desi guys Roku HDMI stick (Cheaper option) or Roku 3 is the best Streaming device to watch your TV and you would not need any cable connection and pretty much manage with your a high speed internet connection to watch good content. To summarize Roku is a value for money option! Disclaimer: I am not getting paid for writing about Roku/ Chromecast/ Tentkotta etc. This is just a review based on my personal use of each of these devices and apps. I like to share the learning with others, and that is what I do in this blog. If you like this article / have any questions / feedback to stop / write more please leave your comments below. Very informative. How do I watch tamil movies on Einthusan or similar on my Roku 3 ? Thank you. Hi Rajiv - Thank you very much. But if you still want to use Einthusan , you can use it in your windows Laptop ( Windows 8 or above only) to use the Screen Mirroring feature mentioned above in the post to stream your movies. But give Tentkotta app a try and you may like that experience more. Will definitely try out Tentkotta. I'm in the process of " cutting the cord " and am exploring all avenues ! I'm assuming I can Screen Mirror my apple devices as well ?! Thank you very much for responding. It is very helpful. At this point they are offering this Screen mirroring feature ( which is still in Beta as per my Roku device) is offered for Windows & Android only. Else you could try mirroring from Android / Windows Devices. Hi guys, with one subscription to Sling Tv (with Tamil package) can I watch 3 different channels in 3 different Tv's within the same network (with Roku dongles in each respective Tv)? Hi Vasu, I have not tried this in the same IP with two Roku's - But I did try with two Roku's across two different houses(i.e. different IP address). Sling did not allow to simultaneously play in different Roku's , it mentioned that there is already active in some other location and made me deactivate the other to play in the current roku box. There are no limits to the number of devices you stream on with Sling TV. Download the Sling TV app on all of your devices that we support. While you are able to stream on all these devices, you may only stream Sling TV on one device at a time. When you add HBO® to your subscription you can stream HBO® content on 3 devices simultaneously. But for all our Sling International customers have the option to stream international content on up to three devices at a time at an additional cost. I tried searching for what is that additional cost, but could not find in their FAQs or any where in the package. So may be you can check with their customer care to see what is that additional cost for streaming in multiple devices. You didnt review Amazon Fire at all. Dear Anonymous - reader thanks for spending time to read and sharing your comments. I will add a section of my review of Amazon fire as well which I tried during this period. Tentkotta has a an app in Roku private store. But chromecast is streaming your chrome browser. So if you have subscription for tentkotta website, you can use it through Roku app store or play the movie in chrome browser and stream it to chromecast. I did not want to have the dependency of a latop or tablet additionally to the tv/ streaming stick. Hence I moved away from Chromecast and works best in Roku. Hi Gopala Also there is one other competitor app for Tentkotta : HeroTalkies https://www.herotalkies.com/. Give that also a try using their free trial. so tentkotta can use vpn to bypass ???? Atleast it took some time for Netflix to block bypassing using VPN. I see still they are not able to completely block the usage. So my assumption is Tentkotta / Herotalkies (both are tamil movie streaming apps/website) similar to Netflix for hollywood would not have built a way to completely block bypassing through VPN. so give a free trial from herotalkies and try using VPN. Let me know how your experience was. Tentkotta and HeroTalkies both have similar streaming and video quality. Even their monthly subscription rate is same at 7.99usd per month. The new movie release is almost the same again, probably the difference you would see is their old movie collection which is different and not actually a comparable parameter - since both are ramping up on this front. Tentkotta does not give free trial, but Herotalkies give for 3 days. Thats is my personal review and I am tentkotta user. they wont accept paypal ? Hi Gopala, I am living in USA. For the trial usually most of the service providers ask for Credit card details including netflix, and enable auto renewal at the end of the trial period if you don't cancel the subscription. This is how even Amazon prime is sold, since most customers forget to remove the credit card details. So by the 3rd day if you cancel subscription you would not be charged, else you would be charged for a month on the 4th day and they would not refund the one month fee once charged since this is a subscription fee. About payment types, not sure why they have not accepted paypal. Tentkotta is aggressively ramping up their database by including a lot of the tamil movies. So probably you would find more movies in Tentkotta. I am not sure of Tentkotta customer service, I have not contacted before. IF I buy Roku Stick , can I stream movies from Tentkotta without Laptop or tablet? Yes. if you buy Roku stick you can watch movies without any laptop using the tentkotta app in Roku private store. I am using the Roku stick currently and using tentkotta subscription. This subscription is not part of Roku, but you would need to pay separately to Sling international. But they provide all the Indian channels for all languages includes soaps and movies depending on the package you choose. I had Tamil package which included all tamil channels - with live (UK Time) and some recorded versions as well. I am not aware of UAE situation. Do share your experience once you figure out. Hi, thanks for the informative post. I recently cut the cord on cable and bought a Channel master DVR for my OTA channels. Great product and will pay for itself within a year compared to my cable bill. One thing that's great is it's able to connect to the Internet via Ethernet cable and has the ability to pull up Slingtv from the channel guide. So no more Slingtv streaming issues for me. I do still use my Roku for Netflix and cross channel searching and tons more content but wanted to let you know if you're in the US. Hey Nid - Thanks for sharing your input, the channel master DVR, but even the base version is around 200+ USD I guess? I was primarily going for ROKU as it was really a cheaper alternative available. What was the total cost in getting the DVR? Yes, the total cost of the DVR plus separate antenna came out to about $340 for me. But I was paying $50/month after downgrading my cable to the basic channels for the same functionality. So now I have the same HD channels off my antenna and a way to record them for a fixed cost. You do also need an external hard drive but I had a spare and those are pretty cheap these days. I agree the Roku is the most cost effective option with the most content and I think there's a model available with an Ethernet port but for my DVR needs the Channel master works wonderfully. Agreed, I am planning to write a seperate article again with YuppTV exploring YuppFlix. Yupp TV has also improved their device availability, earlier they were not on Roku, but now they have made their way into almost every streaming device and also their own Yupp Streaming player. So I will write about it soon. I forgot to give a link to Russian Channel on Roku. I am not aware of Russian channels and do not understand preferences among them. So I don't think I can write about it. I have difficulty watching einthusan videos straight on my Samsung Smart TV. Something to do with flash videos no longer being supported by Adobe, apparently. Do you know of any solutions to this? I don't have a fast enough laptop to connect to the tv (must need a lot of RAM or something). On a separate note, is einthusan not 'legal'? Einthusan first of all is not a Legal site. But movie streaming providers like HeroTalkies or Tentokotta are providing legal content. You may want to check those options , but currently both provide mostly Tamil movies, and some Telugu movie content as well. Regarding Einthusan apps they have not been maitaning their apps and have put a notice in most of their apps. Even their android app ( which cannot be downloaded from playstore, but directly from their site) are not supported and working any more. So the only option you got now is to open in a browser in your laptop and cast the movies through either Roku/chromecast or through a HDMI chord. Are you sure that einthusan isn't legal? At least, according to their ToS (http://www.einthusan.com/terms/, see Section 3 content and ownership subsections), the content/services on einthusan seems to be owned by einthusan and is available for personal (non-commercial) use. What am I missing here? 25 USD per month means around 2000 rupees? Well it is 10 times costlier than the conventional Dish TV in India which subscribes @200 Rs/month. We can't calculate cost by just converting the currency. 25 USD per month is nominal price in US for most of the service like - internet , mobile connection etc. very useful blog, planning to buy roku.